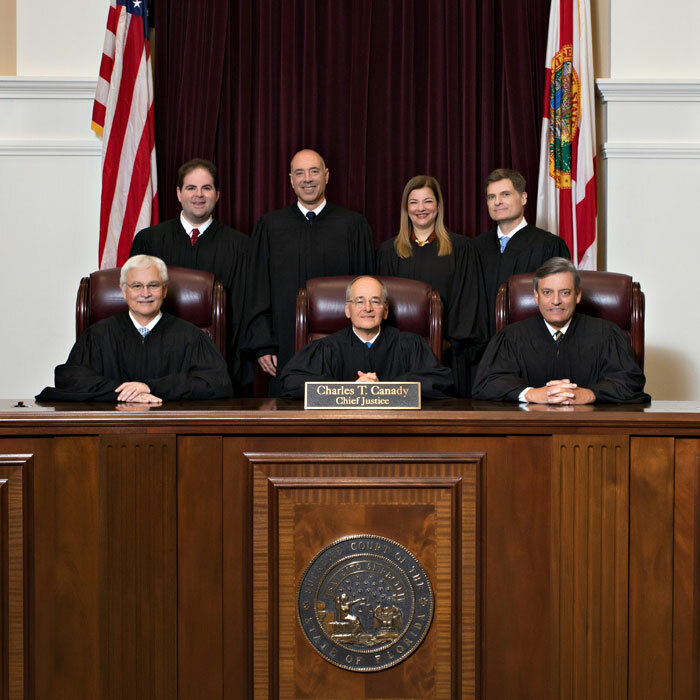 The Florida Supreme Court reserves the right change the type of tour requested based on scheduling conflicts, staffing constraints or changes in the nature of the tour and reserves the right to cancel any tours that conflict with its normal operation of business. Educational Program (students - 45 minutes) - This program educates students of all ages about the judicial branch, Florida’s court system, the differences between trial and appellate courts and the role of the justices and how they are appointed and retained. History about the Florida Supreme Court is discussed and groups are allowed a picture-taking opportunity on the bench. Depending on the size and age of the group, the tour can also include the Library and the Lawyer’s Lounge. These tours vary in length but normally last about 40 - 45 minutes. The maximum number of students for this tour is 50. Adult Educational/Building Tour (adults - 45 minutes) - This program is reserved for older groups and brings the history of the Court alive as visitors learn fascinating facts about the supreme court building and the personalities that have given life to the Court over the years. The tour includes the rotunda, courtroom, library and rare book room. Groups are also allowed a picture-taking opportunity on the bench - time and group size permitting. Educational tours vary depending on the age and size of the group but normally last 40 - 45 minutes. These tours can be tailored to fit your group's schedule. The maximum number of participants for this tour is 50. Mock Oral Argument Program (students - 90 minutes) - The Mock Oral Argument (Mock OA) has long been a favorite activity of student groups visiting the Florida Supreme Court. This tour is normally led by a staff attorney or knowledgeable volunteer. Students act out an oral argument by using a hypothetical case. This is normally 90 minutes in length with the first 20 – 30 minutes used to provide a detailed lesson on the judicial branch, Florida’s court system, the differences between trial and appellate courts and discussing the role of the justices and how they are appointed and retained. This program is for classes of 25 or less students. Self-guided Tour (students and adults - 15-30 minutes) - Groups with less than 10 people have the option of visiting the Court to see the public areas of the building. No reservation is required. Journey Through Justice Program - The Journey Through Justice Program complements the Classroom to Courtroom Program offered at the Leon County Courthouse. Students experience both a mock trial and a mock oral argument to gain a thorough understanding of the difference between a trial court and an appellate court. This is for Leon County schools & students only. Groups larger than 10 people will need to make a reservation in advance for a tour. No food or drinks are allowed in the courtroom. All visitors will pass through a metal detector. Groups visiting the court should arrive a few minutes prior to their scheduled tour to accommodate these procedures. No guns, knives or other items construed as a weapon are allowed in the building. Please visit our ADA page for more information or notify the Marshal's Office at 850.488.8845 of any person needing a special accommodation to visit the Court so that arrangements can be made. Also, note that our wheel-chair entrance is located at the rear of the building (Bronough Street). Visitor Parking is available in the Kleman Plaza Parking garage located one block north of the Supreme Court Building. Since tours are not scheduled during oral argument weeks, teachers have the option of bringing their students to watch a case in person. Reservations are accepted on a first come, first served basis. Read information about attending oral arguments in person. The Florida Supreme Court offers resources about Florida's judicial branch of government for teachers to use in their classrooms.